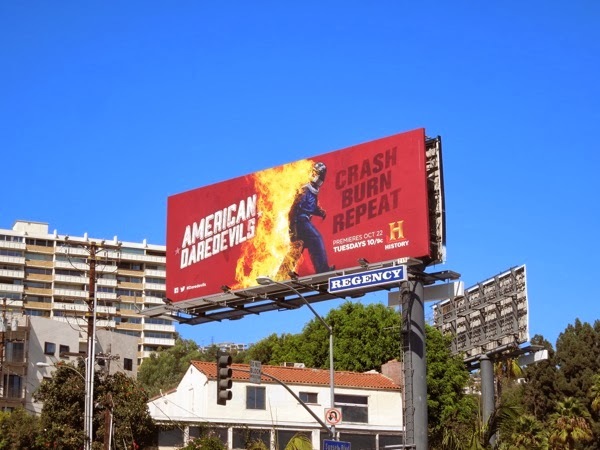 Once in a while you come across a billboard which totally captures your imagination, just like this truly captivating ad creative for History's American Daredevils television series. 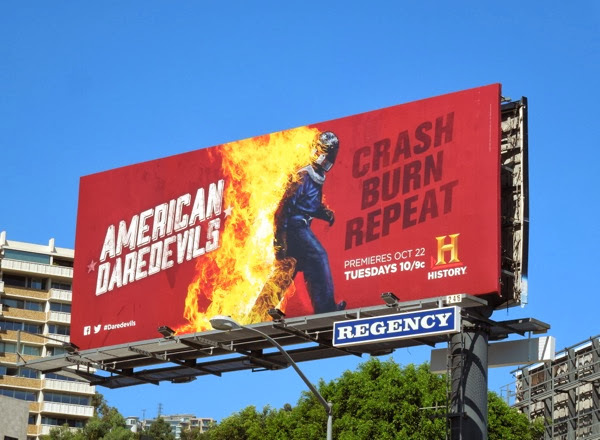 Just be looking at the imagery and copy you immediately know what this show is going to be about, the crazy stuntmen who travel the U.S. performing death-defying stunts for audiences in towns across the country. 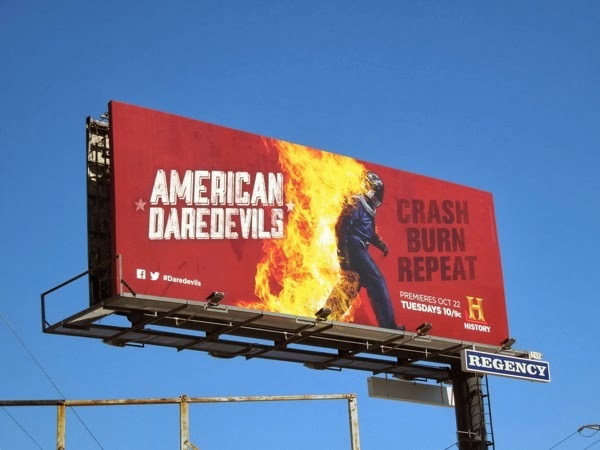 Following in the footsteps of the iconic motorcycle daredevil Evel Knievel, these men try and create more and more daring feats, be it flying through the air in cars or on motorbikes, jumping off tall buildings, lighting themselves on fire, or even more risky record-setting stunts. 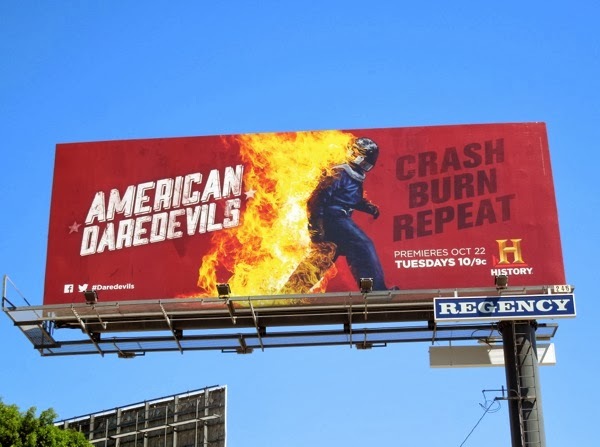 Daily Billboard first spied this eye-catching ad along Sunset Boulevard at Horn Avenue on September 16, 2013. 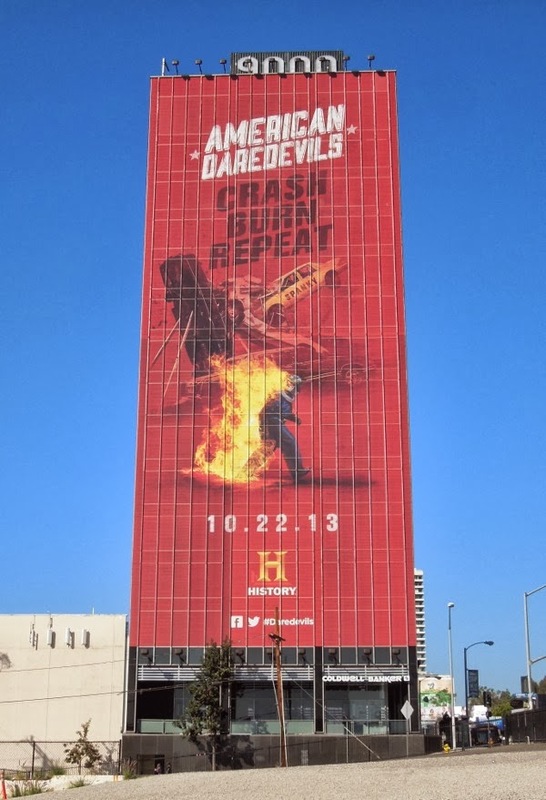 If you like this ad creative, be sure to check out these other compelling History Channel billboards. 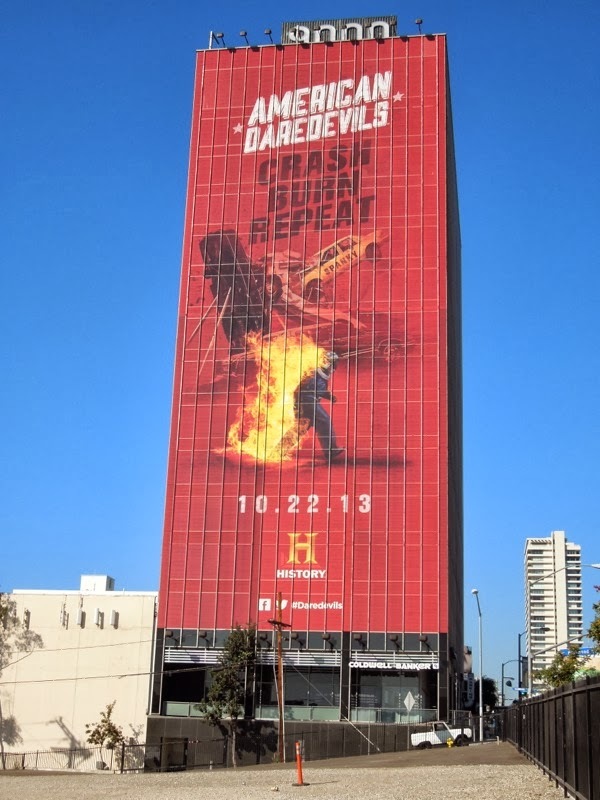 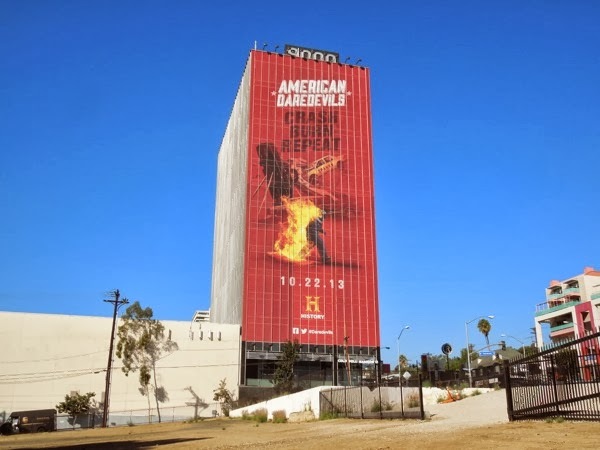 UPDATED: With the air date fast approaching, History is throwing some super-sized support behind the series debut of American Daredevils with this giant billboard along L.A.'s Sunset Strip spied on October 18, 2013. 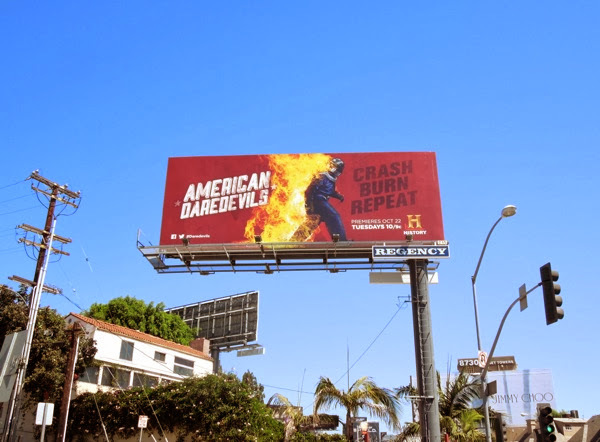 The bold red expanse makes for a welcome change along this busy stretch of Sunset Boulevard and you certainly get more of an idea of what the show's about with car stunt crashes included in the visuals. 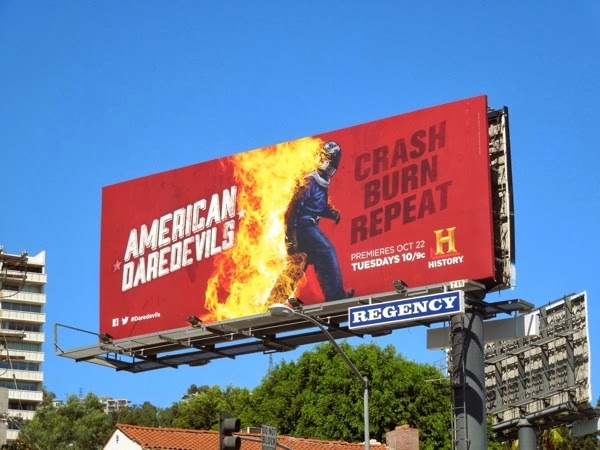 However Daily Billboard wonders if the central image from the smaller billboard of the stunt man on fire on its own, would have made a far more striking 50 foot visual towering over this major traffic artery.